With broken hearts we share the loss of our cherished Jenna who passed away suddenly at the age of 19. Much loved and forever missed daughter of Karen Lorente (Blair Henderson) and Des Lorente (Jacquelyn Fisher) and treasured sister of Hannah and Grace, all of Elmvale. Dear stepsister to Maggie and Devin Shoreman. Lovingly remembered by her grandparents, Dave & Kay Lorente of Ottawa, Heather Reiten (Rene) of BC and David & Brenda Smith of BC. Jenna will be missed by aunts, uncles, cousins, friends and her beloved Sawyer. 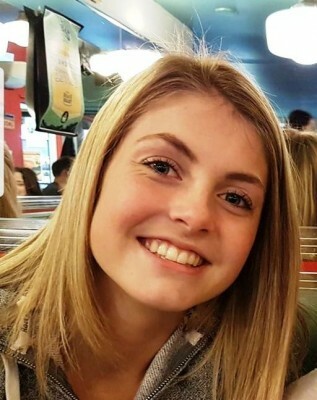 All are invited to join the family at Lynn-Stone Funeral Home, Elmvale, on Saturday, April 13, 2019 from 2 to 6 pm to celebrate Jenna's life. Eulogies will be held at 4 pm. In lieu of flowers please consider memorial donations to Canadian Mental Health Association – Suicide Prevention.